(Bloomberg) -- Madewell, the casual solution to J. Crew Group Inc.’s struggling namesake line, is plotting its methodical expansion as the once-stagnant American denim market has somewhat of a moment. The apparel brand popular with millennial shoppers has opened four new stores already this year and is planning about six more by February 2020 from Southern California to Tampa, Florida. That’s even as sister line J. Crew shuttered dozens of locations and rival mall stores like Gap Inc. ax hundreds more. The newest shops include the storefront Madewell launched in Hudson Yards, a $2 billion shopping center that opened to the public last week on Manhattan’s far west side. At least one of its new locations will be a concept store with a focus on menswear and denim -- two markets with room to grow. 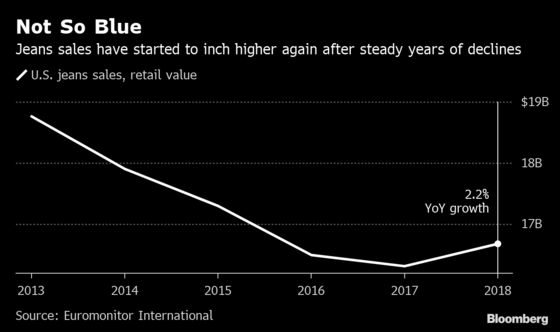 Ten new stores isn’t a rapid retail expansion by some brands’ measure, but it’s a jump for a company with only about 130 stores. This build-out also marks Madewell’s first test of new formats, like ones that go all-in on jeans, part of an effort to stay nimble and relevant as the traditional mall-based retail sector remains under siege. The focal point on denim comes at a watershed moment for the jeans industry, which is showing early signs of coming back after years of market-share loss to yoga pants. Levi Strauss & Co., the company that patented the first part of blue jeans in 1873, went public this week after the jeans category in the U.S. rose in 2018 after four straight years of declines. Still, this apparel staple isn’t out of the woods yet, with Diesel USA Inc., known for its popular five-pocket jeans, filing for Chapter 11 earlier this month. The jeans focus will be on full display at Madewell’s new retail concept, Denim Edit, slated for its grand opening in Nashville on Thursday. The 2,800-square-foot store that houses Madewell’s largest assortment of denim has a spot for customers to get their jeans embroidered and clothing tailored. The male shopper is also top of mind in the Nashville store, Wadle said. The retailer launched its men’s line last fall, and it’s been playing with the shop-in-shop concept, like the menswear one in Manhattan’s Meatpacking district above the women’s apparel section. Wadle’s multi-pronged strategy has been working: Madewell’s same-store sales spiked 22 percent in the fourth quarter, according to results released Wednesday. Those are strong numbers that would make most other retailers blush, including J. 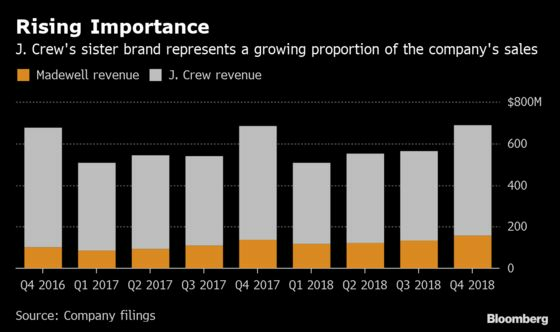 Crew, whose comparable sales for the namesake brand gained 6 percent in the period. Madewell is also beginning to represent a larger share of total sales at the closely held company. J. Crew has had some struggles. James Brett, the former chief executive officer of the parent company, departed abruptly in November after little more than a year on the job. His responsibilities were distributed to four executives, with Wadle among them. The company doesn’t have a CEO right now. Despite the changes at the parent company, Wadle said her attention is primarily on the unit she controls.